Raif Badawi is always in imminent danger of his punishment being resumed. He still awaits 950 lashes with a whip. Saudi Arabia’s thought-police know that any news about a prisoner can be one more form of punishment for his family. Raif Badawi is always in imminent danger. The mental torture never ceases. When his story grows more prominent, as it has since the arrest of his sister, Samar Badawi, on July 30, 2018, that torture only becomes sharper. It becomes exquisitely more difficult to find hope. For Raif—and for his lawyer and brother-in-law Waleed Abulkhair, who is also in prison in Saudi Arabia in a gross violation of his own human rights—and for their two brilliant and courageous wives, Ensaf Haidar and Samar Badawi, today is another challenging day. Each one is. Each day, news or none, is spent weighing the choice between daring to dream of freedom or to not expend energy in the risky business of dreaming. Saudi Arabia arrested and imprisoned Samar Badawi on July 30, possible charges and location unknown as of this writing. This post lists the articles I wrote over the last three-plus years about Raif Badawi, a young writer whom Saudi Arabia has punished for his essays, and whose story is finally an international matter this week in a conflict between Saudi Arabia and Canada. I will file a more current post tomorrow. Raif Badawi has written things like the quote at the top, and his home nation, Saudi Arabia, arrested him and put him on trial for apostasy. His country has an official religion, and those convicted of renouncing their religion are punished. With death by beheading. Raif was not found guilty of that charge but he was found guilty of “insulting” the home religion. 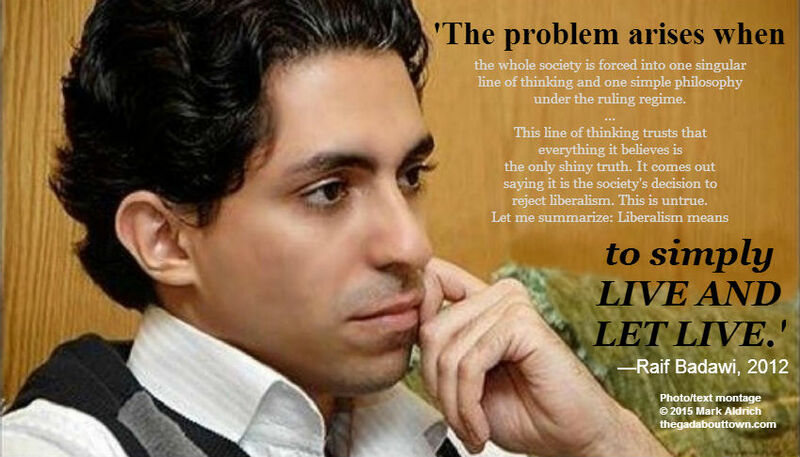 Badawi is a writer who started a blog entitled “Saudi Arabian Liberals” (it was on WordPress, like this one), then was arrested in 2012 and charged with “insulting Islam” and with apostasy for his writings, was found guilty of insulting Islam, and was given the fearsome sentence of 10 years in prison and 1000 lashes. On January 9, 2015, he was whipped in public for the first time; 50 lashes were delivered. He has not been whipped in public since; he has also not been seen in public since. This is what Ensaf lives with every second. Every prisoner’s loved ones around the world live with something like this, especially those with a sentence that includes corporal punishment and the corporal punishment is for writing, for the expression of thoughts. Audacity is not quiet, but Raif Badawi’s essays are quietly audacious. His stand against theism and against the bigotry that of necessity supports theism offends no one who knows that all individuals are free to believe (and to not believe) as they will, but that that particular freedom demands that no one, that no state, may dictate what transpires in another man’s head or heart. States that are built on a religious foundation limit their own people in a circle of faith and fear. Abdullah al-Qasemi, the chief proponent of logical thinking in the Arab world [and whose works are banned in Saudi Arabia], agrees that other states celebrate the pleasures of brilliance, creativity, civilization, and life that are forbidden us. Badawi does not report how his friend reacted to this; it strikes me that there are office-holding and office-pursuing individuals in the United States of America right now who sound too much like those whom Raif Badawi is writing against. I made a poster years ago to remind myself that Raif is not a symbol; he is a human, a man, a writer, a blogger who wrote his opinions and published them yet lives in a nation in which writing opinions can be viewed as a crime. Yet his writing is peaceful, calm; his essays are a few more bricks we can use to build a more peaceful, compassionate world. It is a more tightly controlled prison compared to Badawi’s previous prison. It was reported to me two years ago that Badawi is well-fed and is in good health, generally, but it is a harsher prison, and this has taken a physical toll on him—the arid air north of Jeddah is difficult to breathe for Badawi, which is something new that he has had to deal with since he was moved to Dhahban—and has strained his mental health. At Dhahban Central, prisoners are under orders to pray towards Mecca twice a day—and the guards make certain that everyone does. Prayer is not voluntary. Raif Badawi is a symbol; for much of the world, his is the face of the hope that the Arab Spring engendered. In his essays, he compares that hopeful moment to the French Revolution, and his comparison is not extreme. But his ongoing imprisonment—and the sight of him being whipped on January 9, 2015—is the image of what certain governments will always do to hope. What is one man’s freedom worth, after all? Raif Badawi, a man, lives in imminent danger. Freedom of speech, the concept and mankind’s valiant pursuit of that freedom, remain in real danger today as well. Perhaps more so than even in 2015 or 2012. • May 5, 2017: Will Justin Trudeau Speak Out for Raif Badawi? • March 30, 2017: The Verdict Against Badawi is Upheld–What Comes Next? I’ve missed your posts. Good to see you back again. I know you now have a job that pays you for your excellent work in keeping us informed about atrocities. Chilling how our own society seems to be turning back to some of these practices…or at least trying to.